This. Girl. Is. Darn. Adorable. One is such a fun age because not only is everything still exciting and amazing but one year olds have their own opinions and try as we may sometimes they just don’t want to do what we want. As a Northfield Family Photographer I am used to grumpy, crazy, silly and stubborn and sometimes I think it’s even more fun to work with a different personality and find what makes them excited. In this case Miss Aurelia wanted to find the kitties, to explore and to frown at me! What I REALLY wanted was to get some images of Aurelia snuggling and loving on her mommy because these two are as close as can be and mom really wanted to get some pictures for them both to remember this time in their lives. Aurelia loved exploring by the back of my Northfield Family Photographer property. She loved the branches and trees and she especially loved how we just let her do her thing. 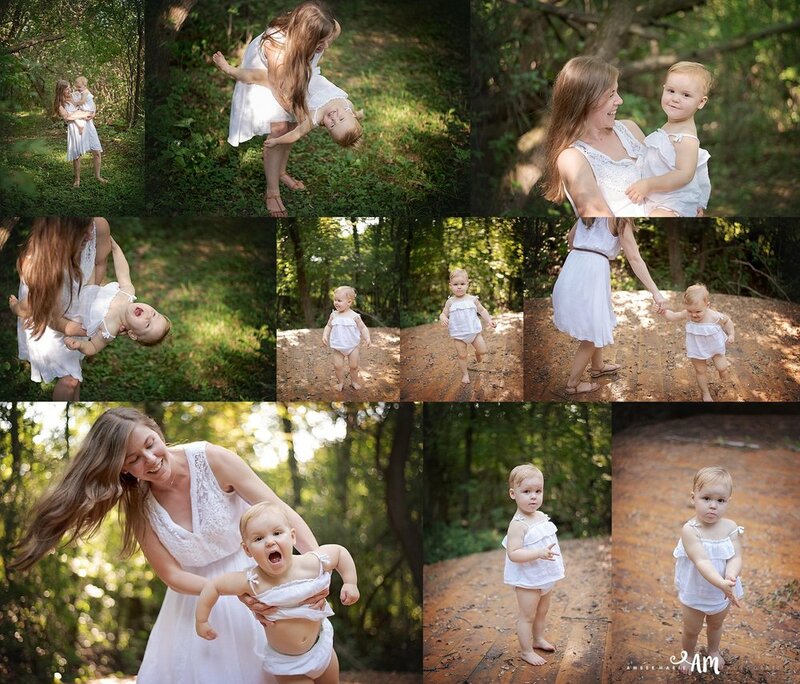 My favorite images from the session are from mom and Aurelia just hanging out. Literally! I love the snuggles and smiles and how simple this set up was. Mom is a nature lover and so is Aurelia so this seemed just right for them. I think if Aurelia was to pick a favorite location on the farm she would pick the old yurt! She loved running around, playing with mom and just in general being silly! The lighting back here is so beautiful and kids LOVE playing on a wooden deck in the middle of a woods. Who knew that something so simple could be so amazing? I am so happy to have spent this sticky afternoon with these two beautiful ladies, I know they love their pictures and will for the rest of their lives. Amber Skluzacek is a Northfield Photographer in the state of Minnesota. She is a full service photographer that creates images and products that will be cherished forever. Her work focuses on using natural elements while posing families safely and beautifully. I love these guys, I love these girls, I love this family! As a Northfield Family Photographer I absolutely enjoy getting to know new people, having new adventures and creating new friendships. Most families opt for fall sessions so they can get images with the warm fall colors, sweaters and layering clothes and lots of snuggles. Summer sessions are such a fun opportunity because the colors are so rich and the weather is warm! It's so fun that these guys like summer because I have so much more availability and time to put into their session (plus they are our best friends so I like to spoil them a bit). Katie is my best friend, childcare provider and our daughters godmother so it's one of my favorite things to create a ridiculously amazing gallery for her every time I have my camera on her girls! 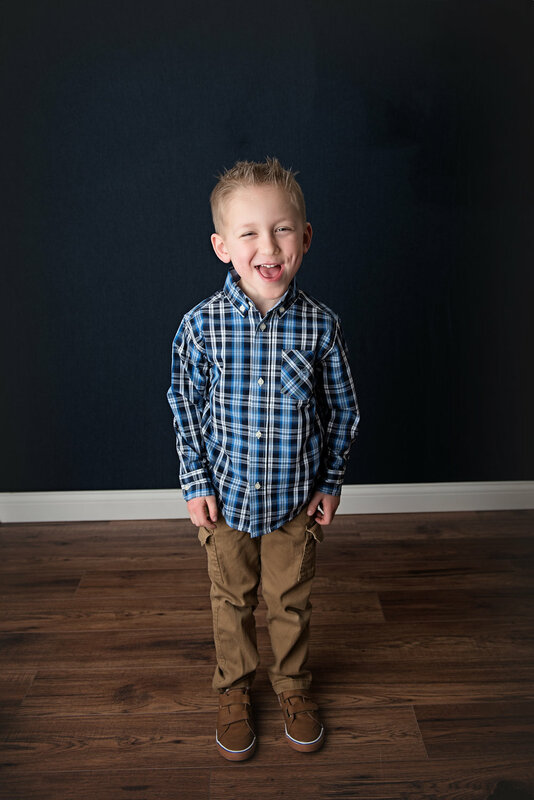 Jake used to hate picture day so much he literally grumbled at me (and Katie) but now after years of me fiddling with him, moving his head and scolding him to make him laugh he comes to sessions with a smile and it's the best! These two girls are so beautiful and have the cutest features! I love Kaylees red hair and freckles and Miss Emily and her dainty smile with blonde locks. One of my favorite parts of being a Northfield Family Photographer is growing and maintaining relationships. As I worked on these lovely ladies pictures I remembered their smiles from last year, two and three years ago and can even pull out the old images to compare. It's special to be and I'm honored to have this role in families lives. Last year I did a session out at the Big Woods and knew I wanted to have this session here this year. I've been waiting all winter to get these little girls to a waterfall! It was such a fun surprise to walk the girls down a river and stand on top of a waterfall! I hope that these memories will be with them for the rest of their lives. Mom and dad always need some special pictures together because it's important! Being outside creates such a fun and easygoing dynamic as a Northfield Family Photographer and I highly encourage families to plan their sessions outdoor. Whether it be December or July there is beauty in our MN climate and it's way more fun to play outside that in the studio! Obviously a waterfall is a great spot for a MN Photographer to hang out and I have not one but TWO within 5 minutes of my studio! Emily being sweet as always! And since we are here lets just play around a take a few pictures having a blast at the falls! Thanks for trusting me to preserve your memories guys. I love it. One is such an exciting time in a little dudes life! 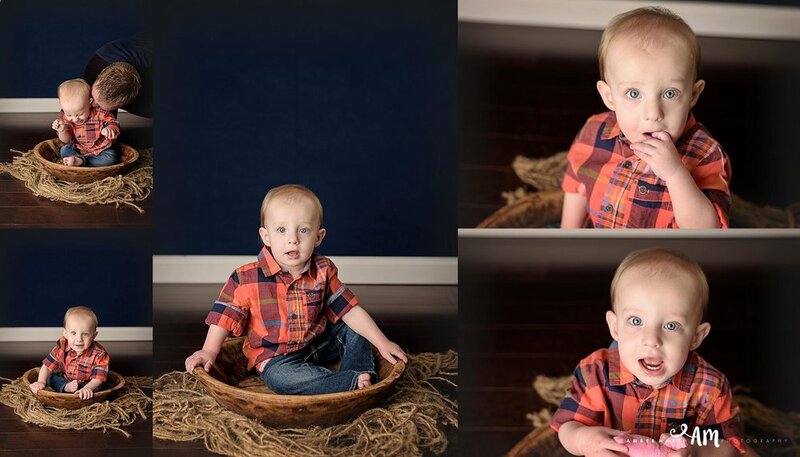 As a Northfield Family Photographer I work with quite a few one year olds and also have been though 4 of my own kiddos! I love how expressive children are at this age and how different each child can be. Mr. Ollie isn’t walking yet but he is cruising! He wasn’t going to let anything stop him from driving his cars all around, not the fact that I was taking pictures and not the fact that he was naked! I absolutely love how this turned out! He just paused for a split second with his drool trailing down his chin and I got it! Being a Northfield Family Photographer you learn you have to take lots of pictures and ALWAYS be ready because you never know what a child will do. Mom and dad brought this special little cowboy outfit so we needed to make sure that Mr. Ollie wore it for at least one picture. So naturally this was the one thing he absolutely didn’t want to do. So goofy! When in need of a smile or a fun facial expression you can never go wrong with, “how big is Ollie”? He was so excited to reply, “so big”! One of my favorite tricks for helping little ones to feel happy and smile is to put mom and dad to work being super silly and playing around. In this case daddy was rocking it with some cheek raspberries and tickles and they were so cute in the one picture I took one with dad too! Out on my Northfield Family Photography studio/farm I have a beautiful Birch tree that desperately needs a haircut! After these guys session I decided that it was going to stay messy because its long branches are just too pretty for pictures. Over by the barn we took a few more family pictures and Ollie was nearing the point where he would throw his body down and yell at us so it was time to be a bit silly and dip him down to play. It was perfect and the exact break he needed. As a fun little treat and a chance to use this adorable antique high school we grabbed a little donut snack for Ollie. Naturally we all thought he would dive in but Ollie had other ideas. He nibbled, he tasted, he looked at us with a confused face and then decided all was good with the powdered sugar donut. After a couple tastes he threw it on the floor. What a goof! I had so much fun hanging out with Ollie and his parents and taking his one year pictures! Leave some love for this adorable little family in the comments. 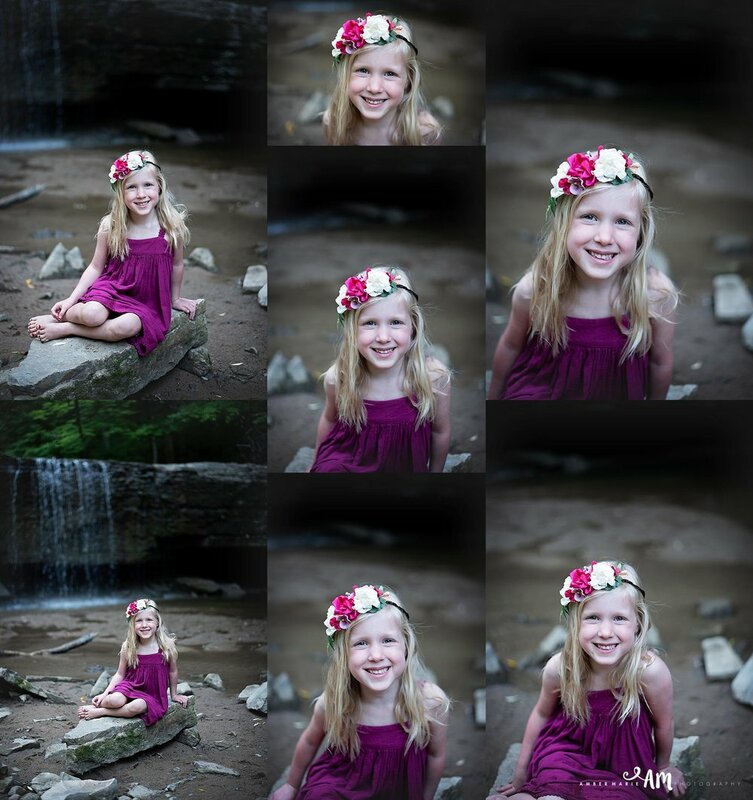 Amber Skluzacek is a Northfield Family Photographer in the state of Minnesota. She is a full service photographer that creates images and products that will be cherished forever. Her work focuses on using natural elements while posing families safely and beautifully. Hi! I'm Rhyan and the fastest crawler on the history of the planet! I love visiting our MN family photographer Amber with Amber Marie Photography. She's fun and makes my daddy swing me around in the air and be so silly with me! I had a lot of fun at my ONE year old session this spring! Amber came up with all sorts of simple but fun set ups for me to hang out in and each time my mom or dad put me in place I took off crawling as fast as I could. It was fun, like a race or contest against my parents and I kept winning! See this big smile here? Amber, our photographer, had daddy fly me around the room in the bowl like a flying spaceship or an airplane! You'd think I was happy to chill in the bowl but not really. 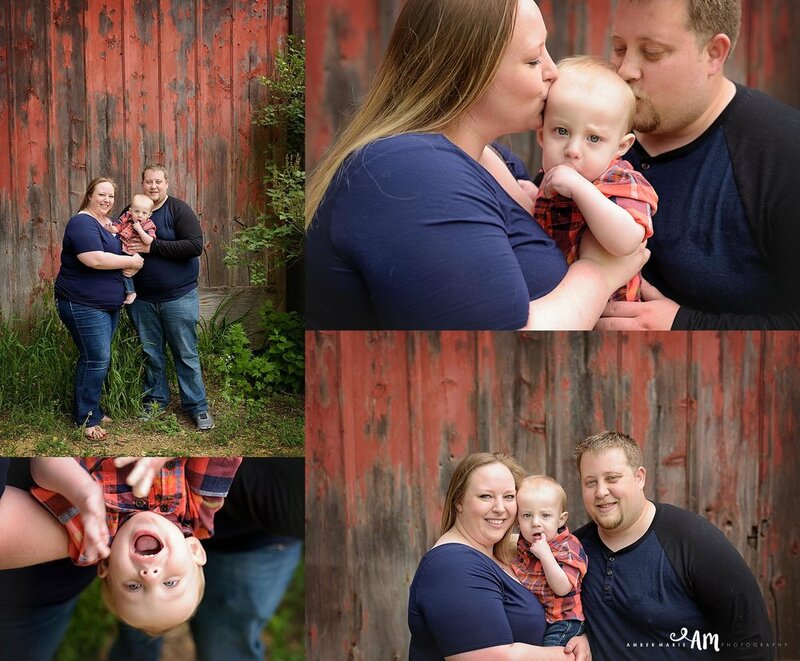 Our Northfield Family Photographer is tricky like that! She still made sure I was having fun but how she got me to smile in each picture is sometimes surprising! One of my favorite ways they convinced me to smile was the snacks. I love a good snack and being so active and little I pretty much always want a little something to give me energy. Once I was just over picture day they took me outside! It was like a whole new day with all the fresh air and plants. I have to say it. It's crazy how many pictures they took today! I really thought that all the running away and grumpy faces would have prevented this but here they are. Some of my favorite pictures are the ones with my mom and dad and then the three of us together. I am excited to see how our family will change and to be able to look at these special pictures of just mom and me and dad and me. During some of our family pictures I even got to try tasting some flowers! The flavor wasn't so great but I tried them a few times just to be sure. You never know if they might get tasty. As I wore out a good game of "How big is Rhyan"? completely made me forget and get happy. I mean after all I am getting "SO BIG"! I really am glad my mom and dad planned this special day. It's easy to forget to cherish these little things. I enjoyed my first visit to the Northfield Photography Studio and highly recommend you visit too! You'd never guess how old this little doll is?!!! 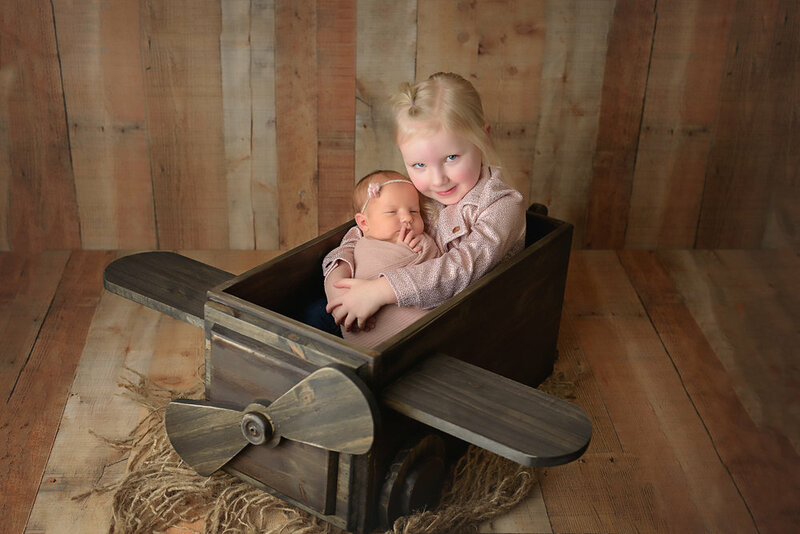 Most newborn sessions take place when baby is 6 to 14 days old but since miss Leona's big sister had her session at 5 weeks her family wanted to have the girls have their sessions at similar times. During their session I kept the props simple and sweet like these two girls. A couple favorite were my big HUGE winter white flokati from Luneberry and my burlap layer also from them! It also worked out great to have Leona's session now since big sister had just turned one and the girls could share their session time! As a Northfield Newborn Photographer I love taking the images that parents are really hoping for in their sessions! After all it's their session time so catering it to their needs is exactly what is right to do! In this case a standard newborn session with some big sister individuals was the right fit. 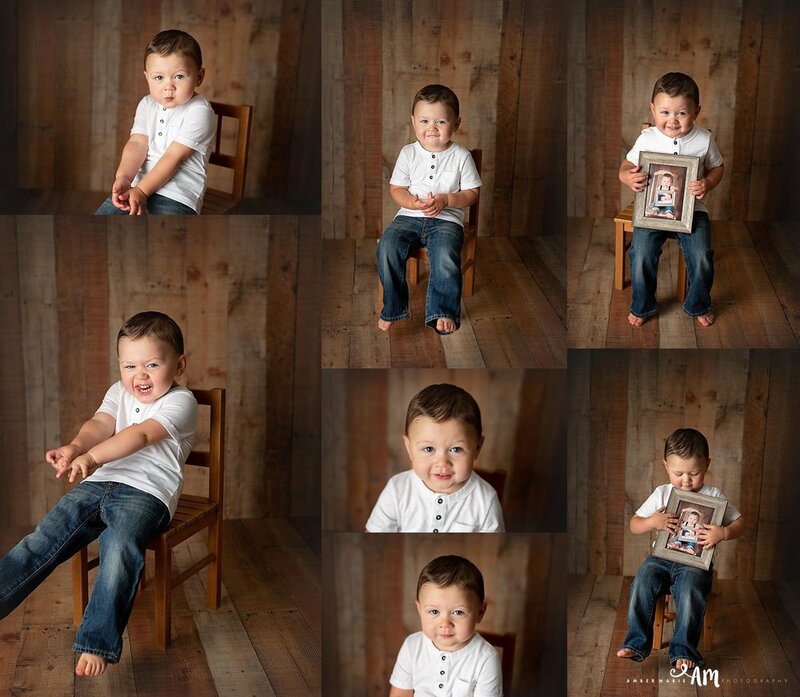 While at the Northfield Photography Studio you have to get some pictures with your kids! It's so hard to get in front of the camera when you are chasing around little ones and it gets harder the more kids you have! Look at momma and her little dolls! So sweet and so real! It's a toss up but I really think the one with Ida poking mom in the face might be my favorite one! It's probably because as a mother I know that my kids are always fiddling with me too. As much as I love a good mother/daughter or mother/son image there is always an exceptionally soft spot in my heart for daddy/daughter or daddy/son images. It goes back to the whole parents not getting their pictures often enough but also to the part where dad is the protector and here he is just cuddling his loves. Perfection! It's always fun as a Northfield Photographer to capture the little things. The interactions between family members are my favorite! Look at Ida look at her baby sister and her daddy look at her. Sweet and simple but so special! Like her big sister Miss Leona LOVED being cozy and super swaddled up! I utilized a bunch of different poses with this wrap since Leona was so happy and warm! Lucky for us Leona also didn't mind being a bit less wrapped up so I could capture more of her sweet little fingers and toes! After all babies grow exceptionally quick and it'll be no time before she's chasing after her big sister. Look at what a serious girl Leona already is! It'll be fun to see if she is more like daddy and Ida is more extroverted like momma. Here is Ida! So big and rocking the perfect toddler pout. I cannot get over how amazingly smart and verbal she is! Ida talked and talked and talked! Our daughter is a bit older than her and barely has anything to say but Ida was quite the conversationalist. So cool! Little bit more sisterly love and more of Leona! Sweet girls. I am so happy for you all as you welcome your new baby girl into your family! You are going to have the best of friends right here. Thank you so much for bringing your little dolls to me to preserve your memories. They are so beautiful. 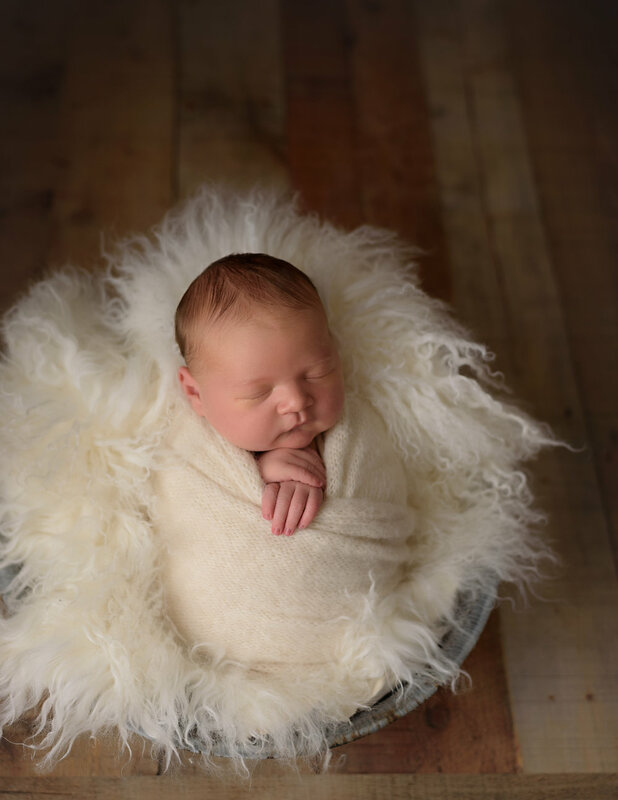 Amber Skluzacek is a Northfield Newborn Photographer in the state of MN. She is a full service newborn photographer that creates products and images that will be cherished forever. 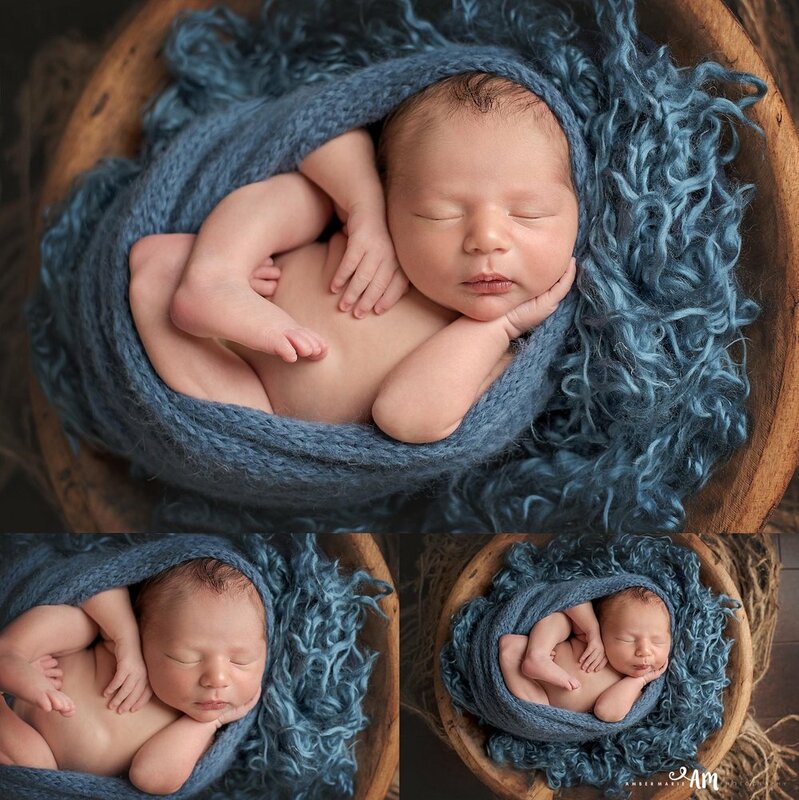 Her work focuses on using natural elements while posing newborns safely and beautifully. Nothing like working with a teensy little baby boy! Mr. Andrew was a such a polite boy for his Northfield MN Newborn Photography session and slept soundly for most of the time. Early on into the session I really wanted to do a hanging image with Andrew. He was so small and such a sleepy boy I knew the result would be amazing and here it is! This is a composite of multiple images. All images where a baby is seemingly supporting themselves in an odd way or where a baby would be in any type of compromising position is composited. As a Northfield newborn photographer safety is exceptionally important and always come first in my studio. Mom and dad images are always one of my favorite poses. As a parent I know how little you feel like taking pictures after you have given birth but also how special it is to have images from these early moments with your new baby. This session was extra fun because mom and dad had some extra special things that they were bringing with to have photographed with their new little boy. The first item was a Houston Rockets run. I wasn't quite sure how I wanted to incorporate a rug into an image and then after seeing it I knew I wanted to treat it like a basketball court and somehow get Andrew onto it. I asked my husband about cutting up a basketball to put him into and he suggested deflating it! We sure make a good team. Here are the final images of the first time I put a baby into a basketball. The second thing that mom and dad were bringing was a superhero blanket. This was extra special to them as Andrews whole pregnancy was superhero themed including his shower. This little superhero needed an extra special set up with his cape and blanket. What made it a bit more cute was a pair of my daughters doll glasses that fit perfectly on Andrews little face. I love the result and my daughter was astonished that he was little enough to wear her doll glasses! As you can see by this diverser gallery Andrew was quite the little model. He snoozed happily while I fiddled and posed and took tons of beautiful pictures! 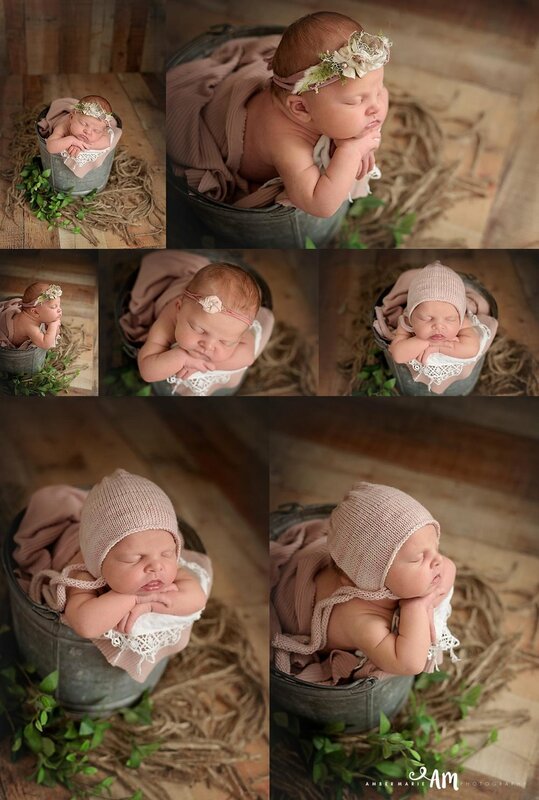 It's crazy to believe but babies are often very settled and comfortable in the bucket pose. The bucket is prepared for their little bodies and they are used to having their hands up by their faces. 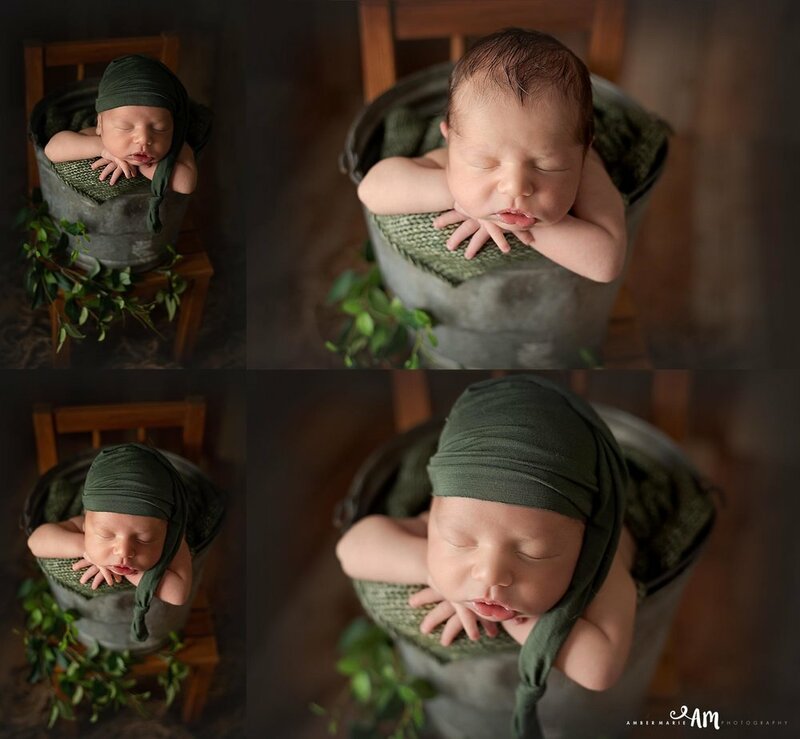 Getting a baby out of a bucket is a bit more difficult but naturally Andrew for amazing for this Northfield newborn photographer. Toward the end of a session I always enjoy doing more "unposed" images and slowly unwrapping babies. It is fun to see how they stretch out and to take a few images that are different than the typical posed newborn set ups. Congratulations Streveler family on your new beautiful boy! I couldn't be happier for you and am absolutely honored you chose me to take Andrew's first pictures. I love working with kids of all ages and am never surprised anymore by how different kids behave. I went into Alex and Will's session ready for anything since I have a bit of experience with boys close in age. Sometimes I feel embarassed because my two boys (ages 3 and 5). We work hard to teach respectful behaviors and still the boys are rambunctious, wild and all over the place. I felt a sense of great relief while working with these two little guys as they were exceptionally similar to my boys. Phew! As a Northfield photographer, I have this! Plus maybe my kids are just totally normal and boys are just like this. These two were so silly, goofy and so much fun. My favorite part of the session (yes seriously my favorite) was when Will wanted to stand on a crate for some pictures. Okay sure! We can do that. Well no sooner than 2 seconds into Alex's idea his brother Will came over and ripped the crate out from under his feet. I immediately thought of my boys and how they would have likely done the same thing! Alex was super impressive on his feet, no pun intended, as he landed on his feet! No tears, no upset. They just kept going like nothing had happened. That is just the most funny thing and I once asked my brother in law when boys outgrow the crazy, energy and rough housing. He said maybe around age 26. Well I think we both have some more time to deal with all the energy with two young boys. They are a bundle of energy but very much fun! I loved working with your sweet boys and thank you so much for trusting me to preserve your special memories. Oh my goodness! Do you see these sweet chubby cheeks?!!! Mr. Thomas was one of my oldest newborn clients even though it's really hard to tell! He was not the standard 6-14 days but a whopping 5 weeks! Sometimes with an older baby they don't want to sleep quite as much. However this was not the case for this handsome boy at all. As a Northfield newborn photographer I always go into a session with a plan (I have worked with baby's parents to find out colors etc. of their home and preferences). Babies don't necessarily follow my plan but this way we can get the session started right away and then when something throws off the plan I have an alternate route prepared! Thomas hung out awake for a short while so I worked during this time to capture his beautiful eyes. His mommy said she was really hoping for some pictures with his eyes open. It can be hard to capture newborn eyes well since they have a tendency to be less focused and moving around quite rapidly, however Thomas was very focused on his Northfield newborn photographer. Congratulations on the arrival of your handsome little man! I absolutely am honored you chose me as your newborn photographer. Amber Skluzacek is a Northfield Newborn Photographer in the state of Minnesota. She is a full service newborn photographer that creates images and products that will be cherished forever. Her work focuses on using natural elements while posing newborns safely and beautifully. At Miss Nora's newborn session I asked if they would like using a green wreath. Little did I know that not only did they love the colors and style but that momma grew up with dogwood and it was very special to her! As a Northfield newborn photographer I absolutely love making these special connections with clients and this was beyond meant to be! Miss Nora wasn't as excited about picture day as mom and dad were but she still tolerated me bugging her and we were able to get lots of beautiful sleepy images of this precious girl. Some of my favorite images as a MN newborn photographer are the cuddles with mom and dad! There is nothing like a daddy proudly holding his new baby or a mother snuggling this amazing blessing that she grew inside of her! I ALWAYS add in momma to daddy's picture and add in daddy to momma's picture. This way you get TWO (or more) family pictures with your sweet blessing in your final gallery. As a Northfield newborn photographer I always try to add extra earthy textures and natural tones to add to images. I love a bit of greenery or other textures! This cream sheepskin is a favorite and if you look through the blog I can guarantee you will see it pop up again and again. It is so beautiful, soft and versatile! I would love every color that Luneberry has to offer but turns out I have to take it slow because there are tons of beautiful newborn props out there! I love to use it in buckets, baskets, trenches on the floor and pretty much everywhere so you can see where it is a favorite. While Nora was awake I took the opportunity to capture a few images with her eyes open and to let her get some wiggles out. Look at that sweet yawn... and boom asleep! As you can see Nora wasn't awake for too long but just long enough to see her eyes, take a few images and conk back out for a few more poses! Thank you so much for coming to me to preserve Nora's newborn images! It truly means so much to be honored with such an important job and I couldn't love meeting new families more! Congratulations and many blessings! Amber Skluzacek is a Northfield Newborn Photographer in the state of MN. She is a full service newborn photographer that products and images that that will be cherished forever. Her work focuses on using natural elements whie posing newborns safely and beautifully. I love families. I love working with relatives and getting to know families even more closely! These adorable little sweethearts were referred to me by their auntie. It was so fun at their session to see so many similarities between the first cousins. Some traits were just crazy like the fact that Lucy has beautiful red hair and her cousin does as well! Right when they walked in the door I could tell that their mom was sisters with my other client. Their resemblance was crazy! I instantly connected with their mom and really enjoyed chatting with her and her husband during and after the session. Finn was just a complete sweetheart during his session and was a wonderful listener but also filled with plenty of pizzaz. He played with me, smiled and acted silly! Just my favorite way for a session to go! I mean seriously look at this smile! You can't look at this picture and not feel happy inside. As a Northfield Photographer I love capturing emotions. Happy, silly and sassy are some of my favorites. Lucy was a bit more quiet but still absolutely a doll. She has the sweetest eyes and dainty features and it was so fun to highlight them while playing around with these two. The best is when she would look at me with a sweet smile. 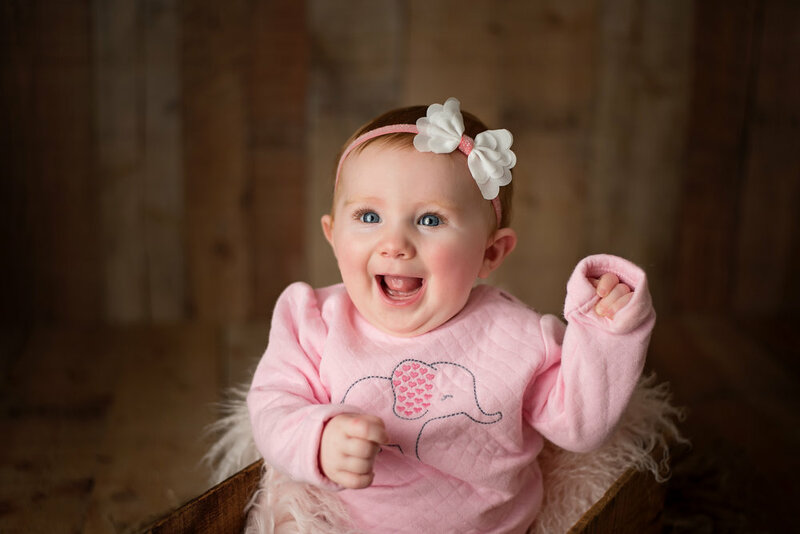 As a Northfield family photographer I can tell that she is going to be an extrovert like her brother when she gets bigger. She's so socially interested and loves making eye contact. I had so much fun getting to know the kids and mom and dad and feel honored that they chose me to photograph their beautiful babies. Kids change so very quickly and these images will last a lifetime. It will be fun to look back in just a year to see how much both Finn and Lucy will have changed! Amber Skluzacek is a Northfield Family Photographer in the state of Minnesota. She is a full service photographer that creates images and products that will be cherished forever. Her work focuses on using natural elements while posing children safely and beautifully. I have been awaiting the day that I would get to meet Miss Adeline for a long time and I know that mom, dad and big sister could hardly wait for her to join them! As a Northfield Newborn Photographer i love getting to be a part of families lives and sharing in their story. This story is especially beautiful as Miss Adeline and her big sister had an extra special journey to get here. Mom and dad have had a hard time conceiving naturally but with the love of God and some help from the medical community they have been blessed with these two beautiful girls. As both a friend and their newborn photographer I knew they were trying again and my family joined in their prayers that Reagan would be a big sister soon. Mid last summer I found out that they were expecting and cried the happiest of tears for this gorgeous family as I knew how long awaited this precious girl was. The day of their session both girls were just the sweetest, most polite dolls. I mean you can tell by the pictures how great they are right?! 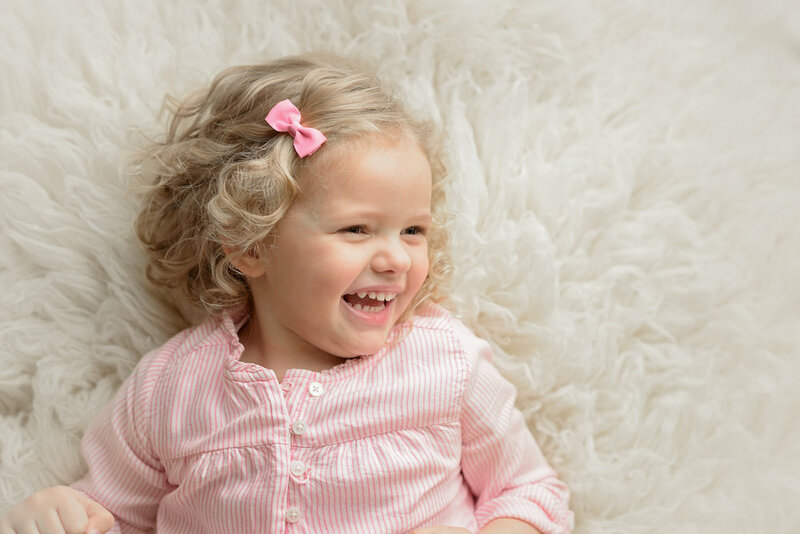 We not only took images of Adeline, but also of Reagan and a few family images. If you are dressed nicely and visiting your Northfield Newborn Photographer you mine as well get some with everyone too! 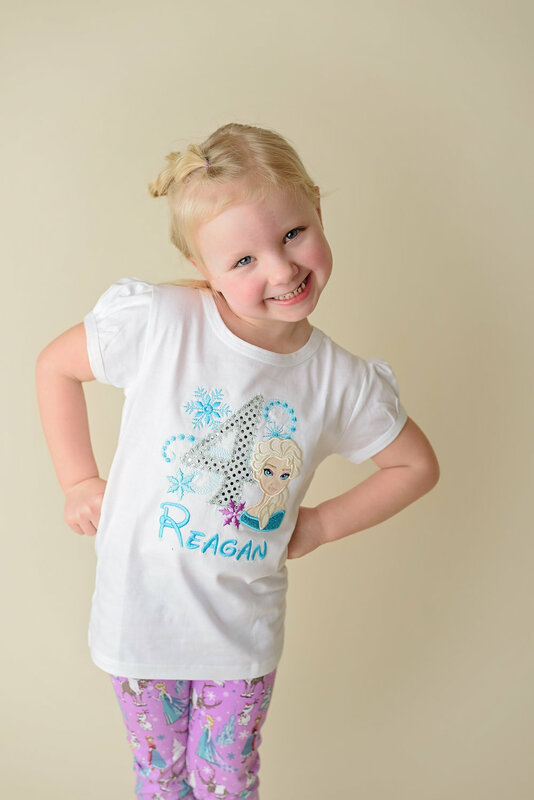 In the past Miss Reagan has been a little bit shy but not today! Nope she was JAZZED! After all she is a big sister, four years old and adorable! It was all silly smiles, giggles and fun as we played around in the studio. She started off by taking some images in her new airplane (courtesy of grandpa Vlasak). This is so very special because almost everyone on mommy's side of the family is involved in air travel! Then we added baby sister and worked on getting the group shots before anyone got too hot! Once we were done with sibling and family images it was time to focus on this beautiful blessing. She was a tad grumpy so I pulled out all the tricks and got her snug and cozy in a variety of wraps. 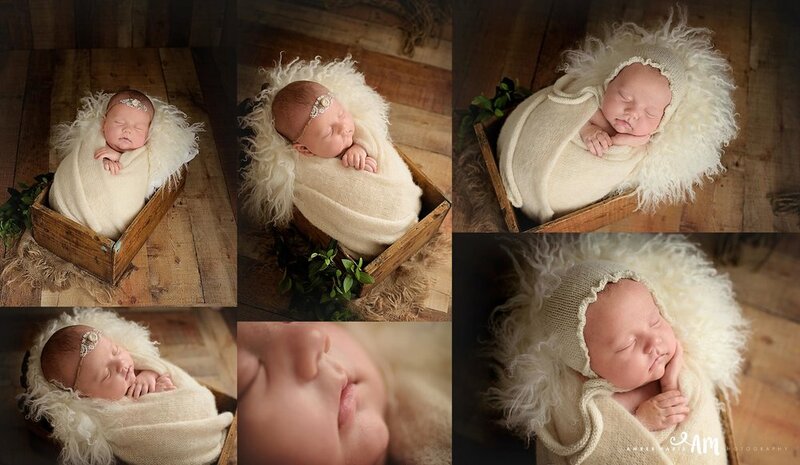 She LOVED being swaddled up and mom and dad LOVED these images of her just snug as a bug! Congratulations you guys, I couldn't be more happy for each of you and your beautiful addition to your family. I am so honored to have taken Adelines first images and love having you not only as clients but friends. 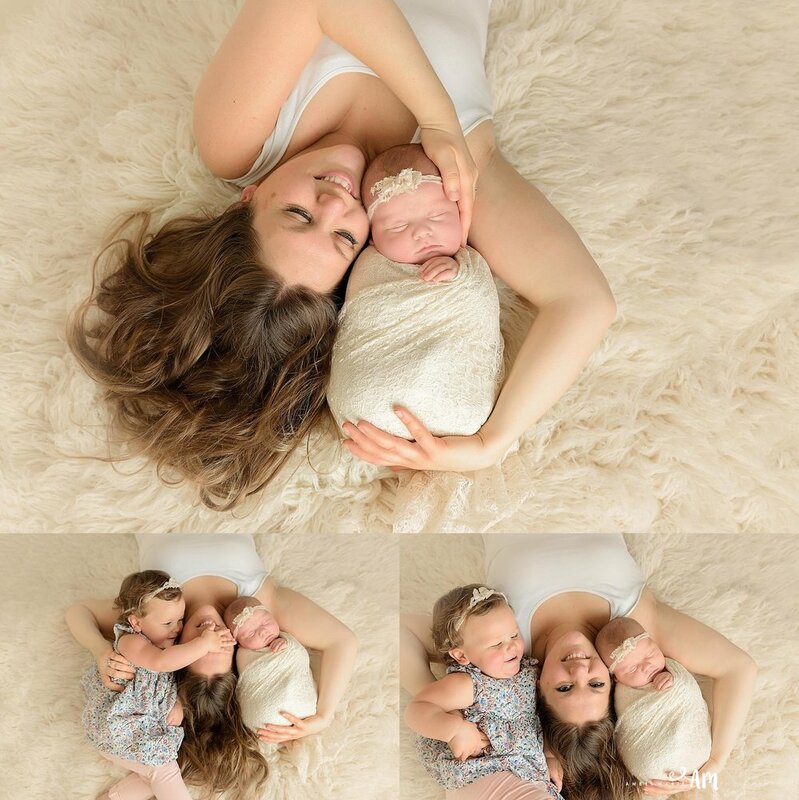 Amber Skluzacek is a Northfield Newborn Photographer in the state of Minnesota. She is a full service photographer that creates images and products that will be cherished forever. Her work focuses on using natural elements while posing newborns safely and beautifully. Oh my look at this sassy little smile! Miss Natalie was so much fun during her session with her baby brother. She was giggly, silly and in the blink of an eye would decide she wasn't having it. A few minute break and some fun and we were back at it with happy smiles. 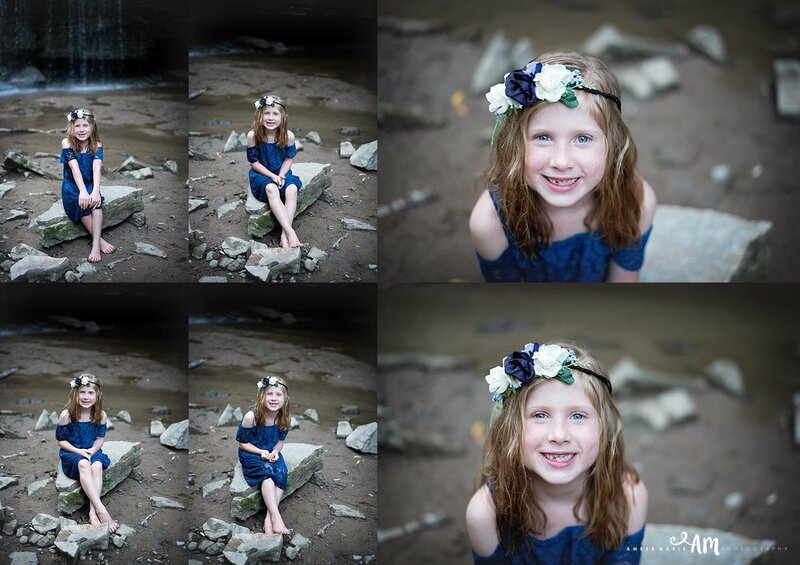 I have been an auntie for 11 years, a mom for 7 and a Northfield family photographer for 3 years and I have never seen a child have such a determined personality. If she wasn't wanting to take a picture she turned off her smile and walked away. Then was she was feeling it, she was right back to her happy silly self. This girl is going to be able to do anything she sets her mind to. Future doctor, or lawyer maybe? Whatever she chooses shes going to do great! Cooper was just a sweetheart as well in a completely different way. 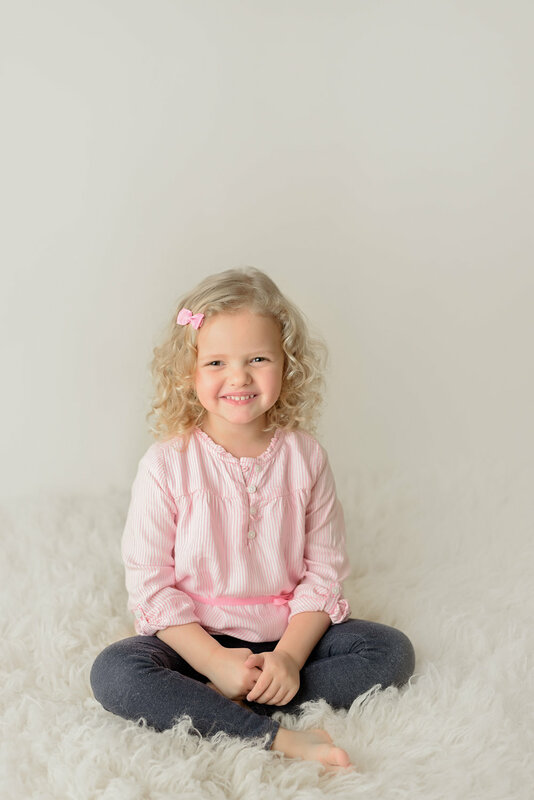 We started the session off with Natalie since Cooper needed some time to get to know his Northfield family photographer. 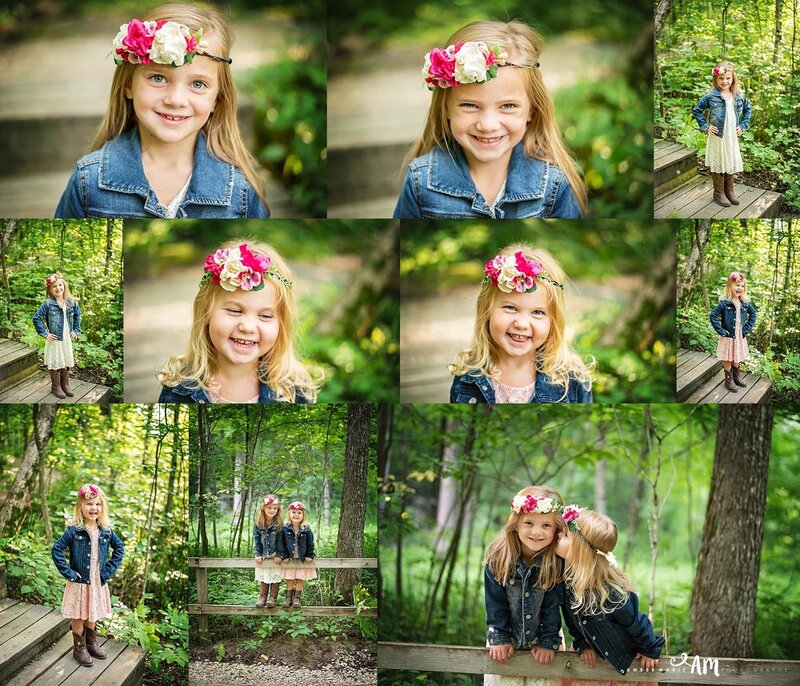 As a Northfield family photographer I always start with the big sibling or the child that is excited and extroverted! This way it gives the younger, more quiet sibling time to get to know me and for me to win over their trust. Cooper was a complete gentleman with the sweetest smiles and big beautiful eyes. He didn't take very much time to warm up and share his beautiful smiles. These two are so cute together and I love their coordinating outfits that big sister help picked out were just perfectly simple and sweet to take their 6 month and 3 year pictures in. Although nothing is as cute as a naked baby belly! Thank you for including me in this special time in your families lives. I absolutely enjoyed spending the day with your sweet babies. Many blessings to you all! Look at this adorable little (okay not so little) boy! I had the pleasure of taking his big brother Colin's pictures last summer and was so excited to find out that they were expecting another blessing this winter. As a mom of 4 kids all two years apart I think we can all agree that I love close siblings. There is no discussion about how much I love babies either! The dynamics between siblings is so much fun. They get to have people to count on for the rest of their lives. People to confide in, to share special secrets and stories and to be able to keep each other company. Of course they can be totally insane at times as well, but you can't win at everything! Boy mom's you know what I mean right? Comment below if you have a crazy boy! Or two, or three! I think these two are going to keep mom and dad on their toes in the upcoming days, months and years. Best part is they will give them so many amazing memories of growing up having a close brother. Colin was super excited about his brother and was loving on him for approximately 1.2 seconds and then over it. Which is pretty typical for a 1 year old. Although not so easy if you want to get a picture together! 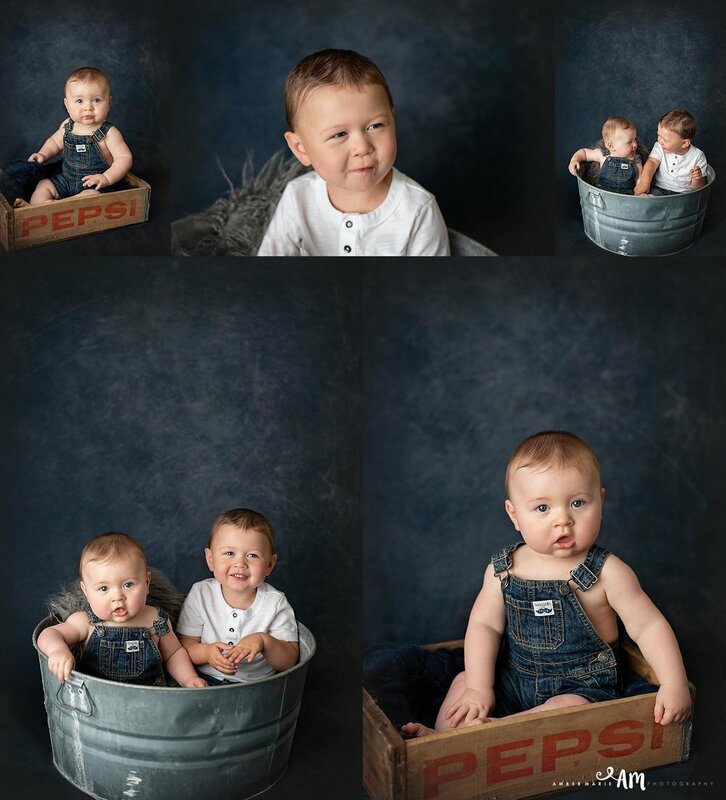 As a Northfield Newborn Photographer I got a bit creative to get some images of the two of them together, something at least to look back at and see how they grow. Summer will be perfect as Trace will be moving around playing with and bugging his big brother. Trace was such a big boy at birth and you can tell how squished he was inside his mamma as he LOVED being squished into wraps and swaddled into the teensiest ball. It's beyond adorable to see a 10+ lb baby curl himself up into a teensy little wrap. Such a perfect reminder of what he looked liked just a short week ago. I could just stare at this sweet image all day. As a Northfield Newborn Photographer I honestly have to say that many of the big babies I have worked with are super strong and like to stretch and push up off of props/posing. He just shimmied in and conked out, precious boy. Just kidding! He stretched out too. Here you can see that sweet belly. Squishy big babies are the best and Trace was rocking multiple newborn rolls. Not that little babies aren't beautiful as well but rolls on a baby just make them extra cuddly! Congratulations on your handsome little man. Your boys are going to be the best of friends for life and I am so happy for you all! I am so honored to have taken Trace's first images. Thank you.